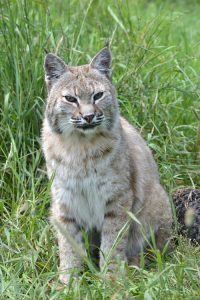 Buddy was privately-owned before arriving at The Wildcat Sanctuary almost a decade ago. He always took life in stride. He wasn’t too hyper or grumpy. Instead, he was calm and personable. That mellow demeanor was the same at feeding time. As other cats grumble for their food and got excited, Buddy always took his sweet time. It was the running joke how long caretakers had to stand out in the cold waiting for Buddy to finish his meal. He would eat a piece, look up and around, get distracted by a blowing tree branch, before going back for his next bite. In his elder years, he enjoyed an indoor temperature-controlled room. That way, he could take as long as he wanted, and everyone stayed warm – including Buddy. About 7 years ago, Buddy started having a weepy eye. It was thought he had a bad tooth, but after several dental radiographs and vet visits, no bad tooth could be found. But the problem persisted and was treated with antibiotics. A few years ago, he was diagnosed with a chronic condition that was inoperable in his sinus cavity. We were informed it would get worse, but could be managed for quite some time with more antibiotics and pain medication. He enjoyed several more years in his tall grassy outdoor habitat. 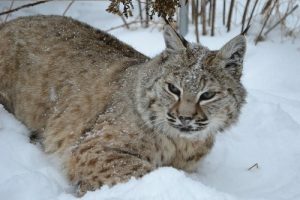 He lived with Canada Lynx Ramsey, but they had more of an annoying brother relationship, rather than best friends. Buddy liked to meet the new neighbors as they moved in and always came over to say “hi” to his caretakers. His favorite past time was marking the outside of his water bowl and creating a mess for the caretakers in the hallway area. Even at his old age, he could spray quite a distance! At 18 years old, he was slowing down. He slept a little longer, his walk was a little slower, but he was still our Buddy boy. But we could see old age was settling in. Most recently, he began to have nose bleeds and the day we said good-bye, we could see he had some discomfort. We promised ourselves, his sponsors and most of all Buddy, that he could stay as long as he wanted, unless he became uncomfortable. Because then he would be staying for us, not him. And as always, our decisions, no matter how difficult, need to honor them. So that it was we did. He left us true to form. As calmly as he lived every day and as peaceful as Buddy was. Your beautiful face and calming presence will be deeply missed. We feel blessed to have you as part of our lives as long as we did. 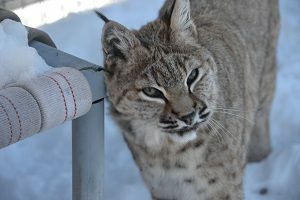 Buddy, a bobcat, was seized from a person who had him illegally in California. TWS was contacted because the owner’s paperwork showed he was purchased from a breeder in Minnesota and authorities wanted to track down the person who sold him. We agreed to take Buddy into our program. He was incredibly thin when he arrived in 2006 and had terrible scarring on his neck from an ill-fitted collar. After a few months, Buddy put on weight, put on a beautiful silver coat and now can always be found purring and rubbing on his enclosure wall. He loves all sorts of enrichment and is the first to mark his new toys.